Form and functionality collide with style in the NexStar 3 SuperSpeed USB 3.0 & eSATA External Hard Drive Enclosure from Vantec. With its mirror finish and sleek curves, the Vantec NexStar 3 SuperSpeed stands out from the crowd. The sturdy drive cage protects your hard drive while the aluminum case effectively draws away the heat, protecting your drive from overheating. Integrated with the latest USB 3.0 technology, performance is increased by 10 fold offering maximum speeds of up to 5 Gbps. 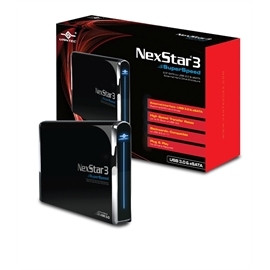 Quickly store and back-up your data with the Vantec NexStar 3 SuperSpeed USB 3.0 & eSATA External Hard Drive Enclosure.